Used on the rib, perfect for storing everything. Dry bag is completely waterproof I use most weekends very hard wearing has so many uses. I use my bag for rowing when we go touring. I use a smaller bag in the boat for day to day use. I recommend for any rowers, sailors or canoeists. Great for putting over the back and going coasteering. Keeps first aid kit and all dry. Kayaking, canoeing kits all dry after a day out. Pilot Gig rowing. 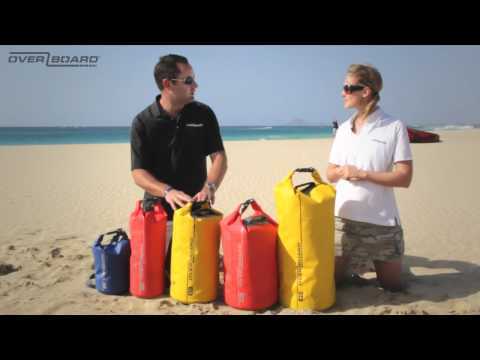 This bag is perfect for all water activities and it floats. I cannot comment on this as it was a gift but the recipient said it was an awesome present. We ordered the dry tube bags for a stand-up paddling tour and they keep everything super dry and swim if necessary. Use for wet dinghy sailing. Tough bag and definitely water proof. Handy strap for carrying. Product quality is very good. I use it swimming from my boat to shore and vice versa with all my goods inside. Completely dry ! Practical size, sturdy detailing. The red colour was not quite as bright as in the picture. I have three of these in different sizes for use on my boat and motorbikes. The smaller ones are a bit more compact for going on the back of the bike but they are so reliably tough and waterproof that all the other bags I've tried rather pale into insignificance compared to the Overboard bags. Used for sailing and camping. Well made and convenient to use. Haven't used the product yet, its for a gift. Appears exactly as advertised and of good quality. Will be used for kit whilst sailing.